Check the images below, leave your thoughts in the comments section, and come back on Friday for the answer. Findings: PA radiograph shows an opaque left hemithorax with a central cavity (A, black arrow) with an air-fluid level (A, red arrow). The splenic flexure of the colon is right below (A, yellow arrow). In the lateral view the central cavity has an inverted U-shape (B, black arrows) with two air-fluid levels (B, red arrows). Unenhanced coronal and sagittal CT show that the central cavity is a dilated stomach (C and D, arrows), herniated through a large rent in the left hemidiaphragm (C and D, red arrows). I present this case to increase your awareness of an often forgotten subdiaphragmatic structure: the gastric bubble. Due to its air content, the gastric fornix is visible in most upright PA chest radiographs, and it can provide valuable information. An absent gastric bubble occurs in 10% of the normal population and 50% of patients with achalasia. Therefore, lack of a gastric bubble should prompt a review of the mediastinum to investigate a dilated esophagus (Fig. 1). Remember that although an absent gastric bubble may suggest a diagnosis of achalasia, visible air in the fornix does not rule it out, as demonstrated in the case below (Fig. 2). Fig. 2. 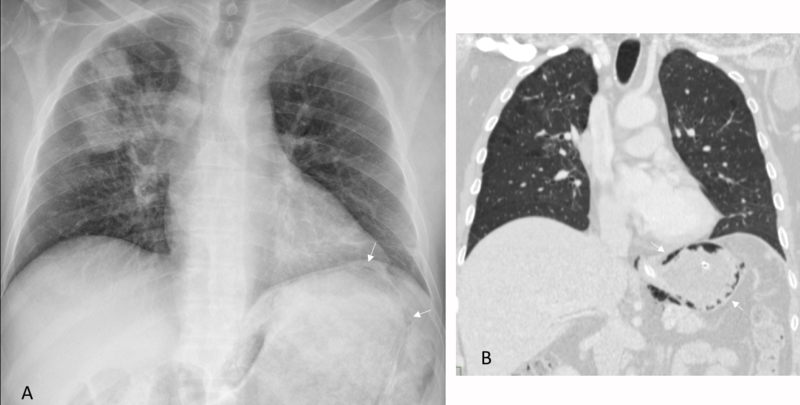 57-year-old man with diffuse pneumonia. 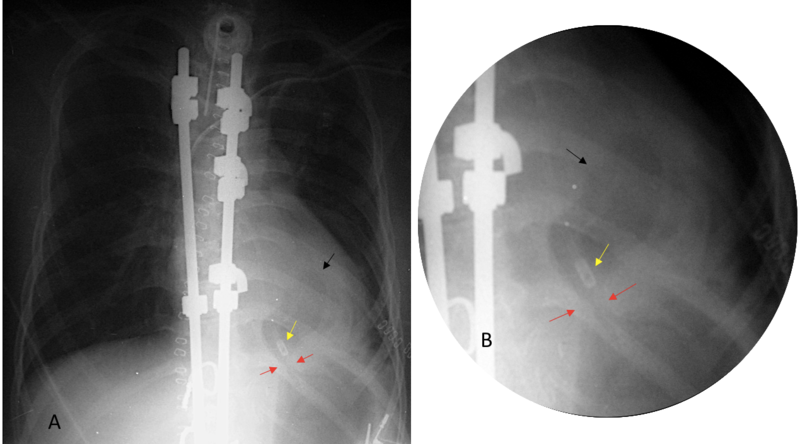 PA radiographs shows diffuse airspace disease and a redundant, dilated esophagus (A, black arrows). Gastric bubble present (A, red arrow). Coronal CT confirms the dilated, food-filled esophagus (B, arrow). Diagnosis: achalasia with aspiration pneumonia. An absent air bubble may happen when the stomach is not in the left upper quadrant. This occurs in a rare congenital condition, abdominal heterotaxia, in which there is rotation only of the abdominal structures. In these cases, the gastric bubble is located under the right hemidiaphragm (Fig. 3). Malpositioned gastric bubble occurs when the fornix is in an abnormal location. The most common cause is diaphragmatic hernia either through the esophageal hiatus (Fig. 4) or secondary to traumatic rupture of the diaphragm (Fig. 5). Fig. 4. 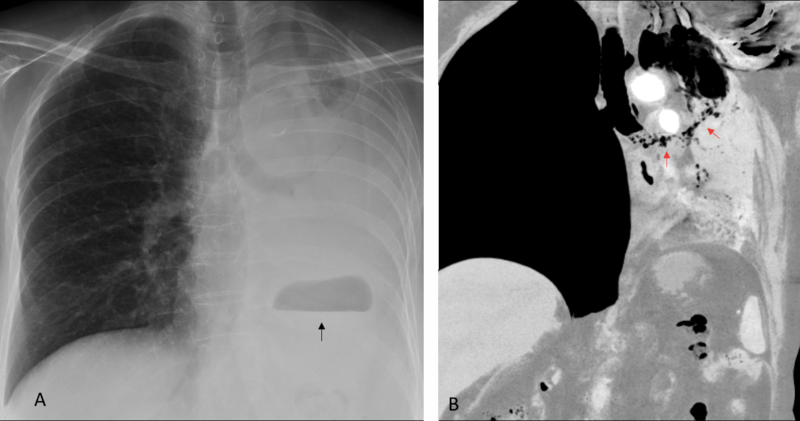 Hiatal hernia with the gastric bubble (A, arrow) above the level of the left hemidiaphragm. 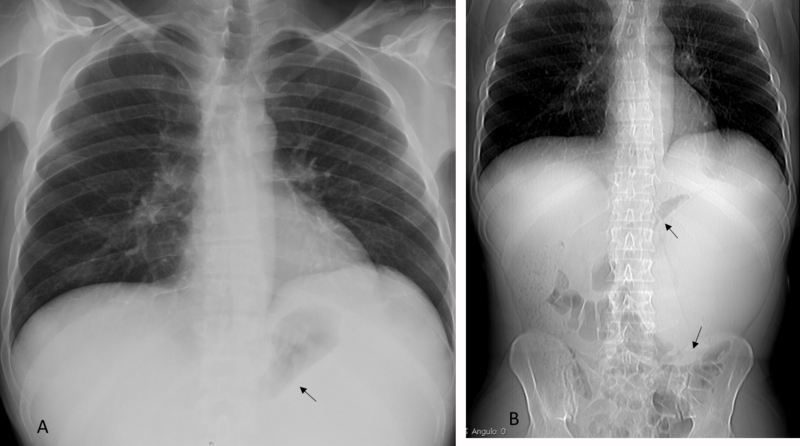 Barium confirms herniation of the gastric fornix and narrowing of the stomach where it crosses the hiatus (B, arrow). Fig. 5. 38-year-old man after car accident and ruptured diaphragm. Note the herniated gastric bubble (A and B, black arrow) and the narrowing where the diaphragmatic tear is crossed (A and B, red arrows). The gastric catheter has stopped at the level of the tear (A and B, yellow arrow). In left hemithorax opacification, an abnormally located gastric bubble indicates the position of the hemidiaphragm and clarifies the etiology. 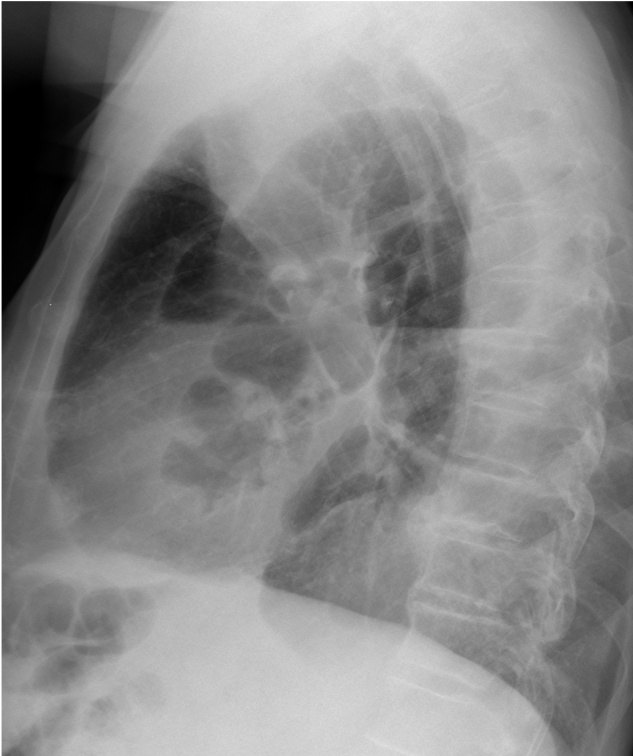 Downward displacement indicates massive pleural effusion (Fig. 6), whereas elevation favors collapse of the whole lung (Fig. 7). Fig. 6. Metastatic disease with massive left pleural effusion causing inversion of the left hemidiaphragm. Note the marked descent of the gastric bubble (A and B, arrow), which marks the position of the diaphragm. Fig. 7. 61-year-old man, short of breath. 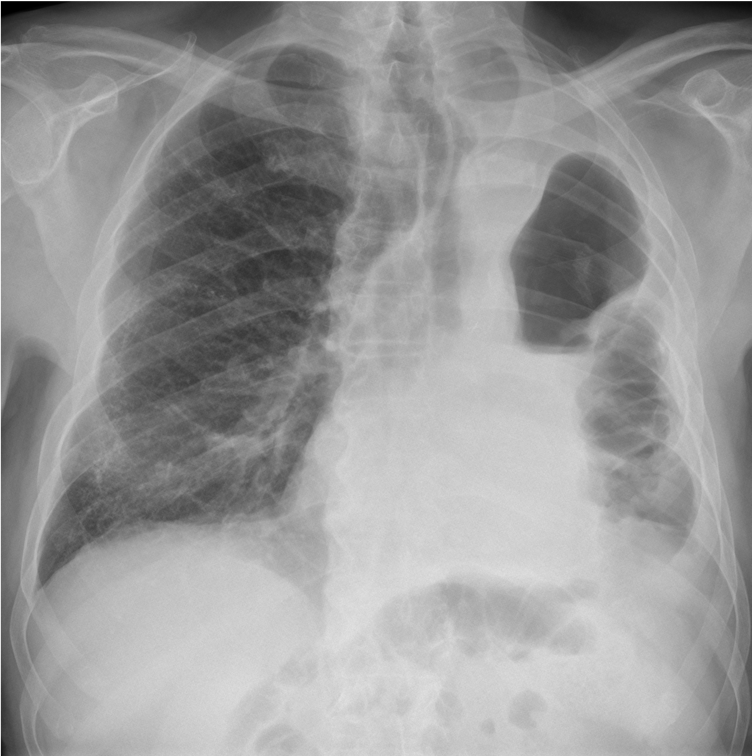 PA radiograph shows complete left lung collapse, confirmed by elevation of the gastric bubble (A, arrow). 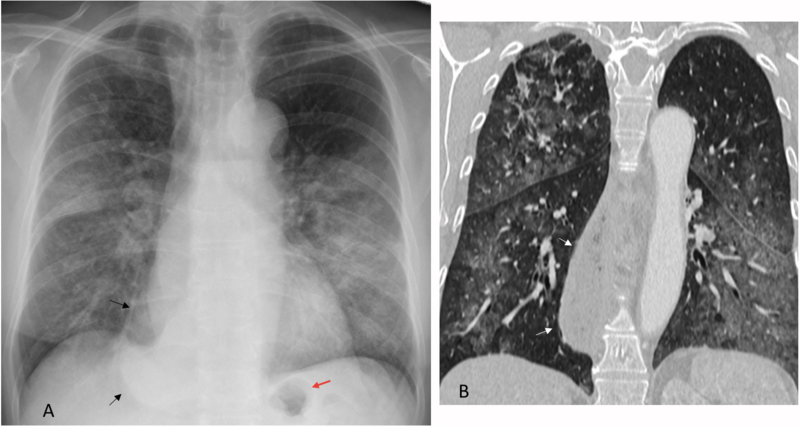 CT depicts the collapse and numerous air bubbles within the bronchial tree (B, arrows). Diagnosis: allergic aspergillosis with numerous mucus impactions. Collapse regressed after bronchoscopy. Gastric bubble displacement is also an indirect sign of an abdominal mass. The most common cause is splenomegaly, which pushes the aerated fornix towards the midline (Figs. 8 and 9). Fig. 9. 32-year-old woman after car accident. PA chest film shows uniform opacity of LUQ with elevation of hemidiaphragm and medial displacement of the gastric bubble (A and B, arrows). Angiogram shows a ruptured spleen (C, arrows) and a large lateral hematoma (C, asterisk). Miscellaneous findings include visualization of masses outlined by air in the gastric bubble and occasionally air within the stomach wall. Masses in the gastric fornix may be due to carcinoma and other tumors, gastric varices, or postoperative deformities (Fig. 10) . Fig. 10. 45-year-old man after a Nissen procedure. 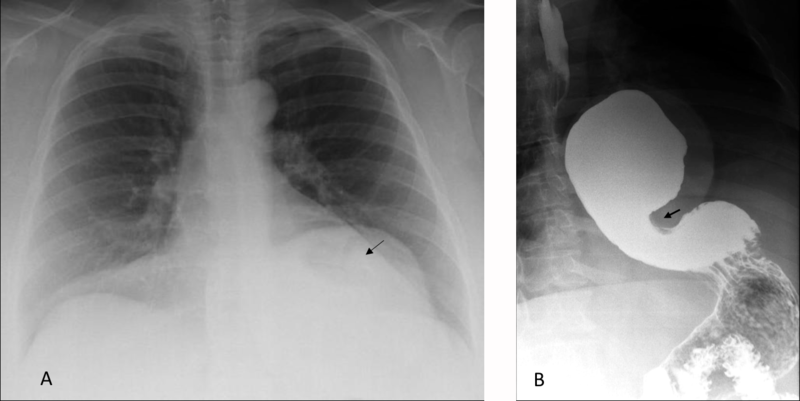 Note the apparent mass outlined by air in the gastric bubble (A, arrow), which looks normal in the preoperative chest radiograph (B, arrow). In the old days, gastric varices were sometimes detected in the chest plain film. Air in the gastric wall may be seen after ingestion of corrosive substances or, more commonly, after forceful vomiting or secondary to an endoscopic procedure (Fig. 11). Fig. 11. Oncologic patient with severe vomiting. 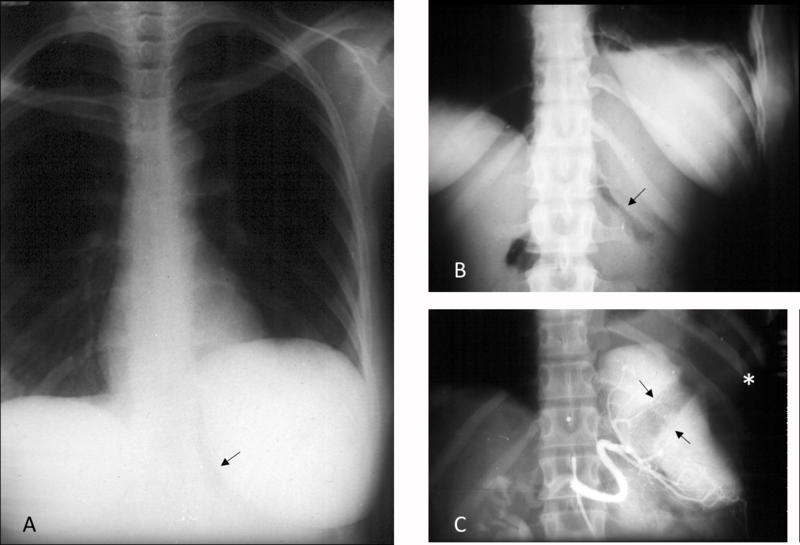 PA radiographs shows dilatation of stomach with air in the gastric wall (A, arrows). Coronal CT confirms the finding (B, arrows). The patient improved with conservative management. Dilated stomach can occur alone or in generalized bowel dilatation. In the second case think of diabetes or mechanical pyloric obstruction (Fig. 12). Fig. 12. 58-year-old man with gastric carcinoma. PA radiograph shows moderate dilatation of the gastric bubble, with a nasogastric tube coiled in the stomach (A, arrow). Abdominal radiograph confirms the gastric dilatation and the coiled catheter (B, arrow), secondary to malignant pyloric obstruction. 1. Absent gastric bubble occurs in 50% of patients with achalasia. 2. 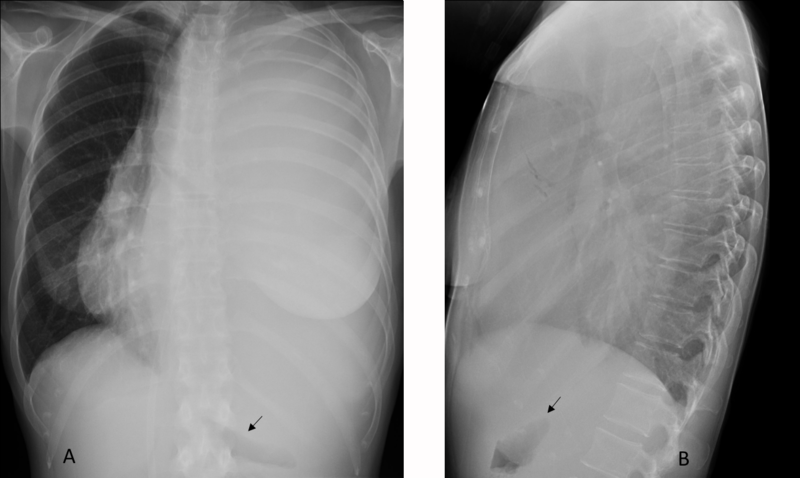 Diaphragmatic hernias cause malposition of the gastric bubble. 3. Splenomegaly is the most common cause of displacement of the gastric bubble. Lossof volume of the left hemithorax. Surgical changes. Hidroneumothorax (with loculate fluid) probably because of broncopleural fistula, but the colon is localizated over the diaphragm (diaphragmatic hernia). I think taht all the diagnosis are achievable (1 + 2 + 3). I can see reduced left lung volume with ipsilateral mediastinal shift. Bowel shadow seen occupying left hemithorax above diaphragm. Large air fluid level seen in upper zone. I would go with diagnosis of intestinal hernia. Strangulation of large bowel hernia with ileus and Fluid level in dilated thoracal bowel loop -> intestinal hernia! Colon shifted upwards in left hemithorax is obvious. Air fluid level in left hemithorax is in stomach which has also shifted upwards. So these are false leads that didn’t cause chest pain. As for other causes: degenerative changes on thoracic spine don’t explain the pain, but I see two paracardial nodules in the right lower zone, suspicious for contralateral tumor recurrence. Remember that this patient is 81 years old. At that age, having pains anywhere is not that rare. I think, that it is broncho-pleural fistula. I see lucency with fluid level in left hemithorax, shifting of mediastinum to left side and patient is after pneumonectomy.. and aetiology of broncho-pleural fistula is common surgery of lung. – is filled by stomach and intestines because of left diaphragmal relaxation. – There are no convincing signs of empyema or hydropneumothorax (due to broncho-pleural fistula). The lateral view shows local decreased transparancy at the Level of the anterior parts of the lower D10-11(?) vertebrae probably because of degenerative changes (bone excrescences) OR the round paravertebral lesion of the right lung which on PA veiw is obscured by the right atrium. Regarding the diagnosis, I believe that the U-shape visible in the lateral view is indicative of stomach or a intestinal loop. in the second case we would see dilated loops in the abdomen, which are not present. Therefore, the most likely diagnosis is herniated stomach. Congratulations to Rubia salman, who was the first to mention herniation. Having troubles to find something? 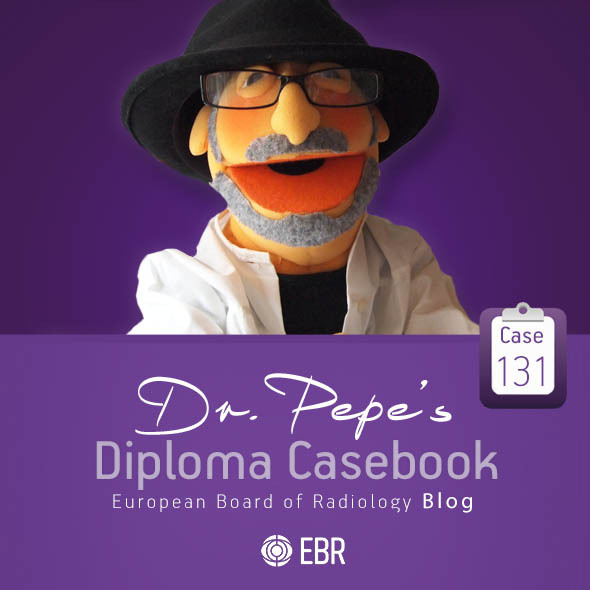 A diploma available to radiologists certifying that the holder has a level of knowledge and competency in line with the European Society of Radiology (ESR) European Training Curriculum for Radiology.